An Amazon robot at a Fulfillment Center in New Jersey, 2017. Amazon has begun rolling out a “new worker safety wearable” to over 25 of its locations over the past year, TechCrunch reported on Friday—namely, a “Robotic Tech Vest” that alerts robots to the location of workers within a facility in order to prevent workplace accidents. Amazon is moving full steam ahead with installing more and more robots in its distribution centers. Over the 2018 holiday season, the company hired less temporary staff yet broke its shipment records, a clear sign that automation is fueling Amazon’s growth. Amazon certainly has reason to invest in safety. Its staff have repeatedly complained of long hours, constant on-the-job surveillance, and unfair pay—but also of preventable workplace injuries in its hectic warehouses. Last April, the National Council for Occupational Safety and Health released a report claiming that Amazon was one of the most dangerous workplaces in the country. The organization wrote that CEO Jeff Bezos, the richest man in the world, gathered such riches “in large part, on a business model that features a relentless work pace and constant monitoring of employees.” Between 2013 and the release of the report, National COSH found that seven workers had died at Amazon warehouses. Carlisle, Pennsylvania” in 2014, according to the report. 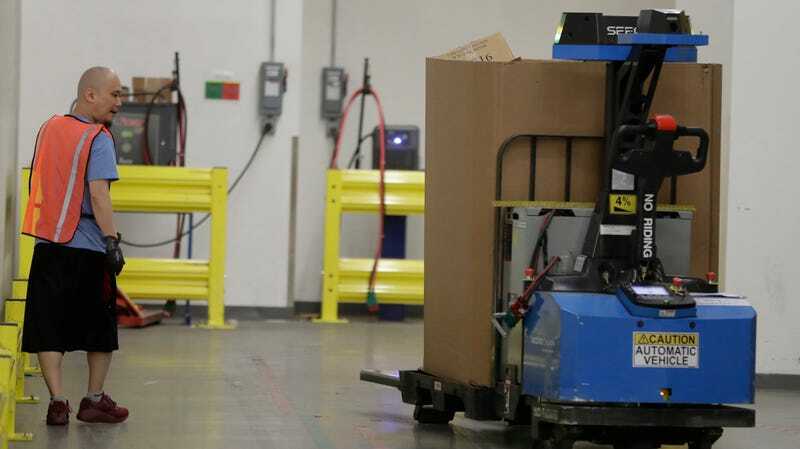 More recently, dozens of workers were injured in December 2018 when, according to the Washington Post, an “automated machine” struck and broke open a 9 oz. can of bear repellent—containing among other things capsaicin, the chemical that gives spicy foods their zing and in high quantities is a powerful irritant.